Safetech have added to their manufacturing resource with the opening of a new fabrication area at their Moe site. It adds a 1,000 square metre of floor space and with 15m height and a new 10 tonne crane, it is ideal for the construction of Safetech's larger products. Chris White, Safetech's Operations Manager, explained that the new building had been outfitted specifically to accommodate large scissor lift tables, goods hoists and pallet handling products such as pallet dispensers and pallet inverters. “We have fitted out with much of our own materials handling equipment - scissor lift tables as work benches, Gorbel gantry cranes, DC lift trolleys and we also purchased a 10 tonne crane from Modular Cranes." "As a manufacturer of lifting, materials handling and safety equipment it is important that we practice what we preach," said Chris White. "All of our facilities are full of our own products to help with manufacturing and safe handling. 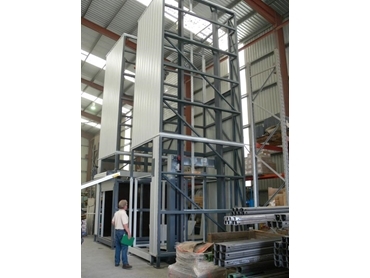 We have numerous scissor lift tables, multiple Gorbel cranes, stretch wrappers and a range of trolleys and turntables. It's a great way to help our workers and improve our products at the same time."